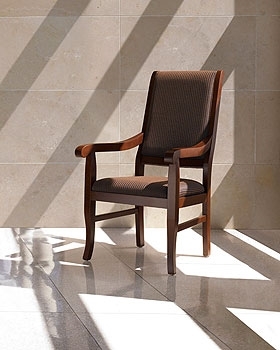 The Roosevelt arm chair is an attractive chair with a high back offering support and comfort while seated. The graceful style provides a comfortable solution for patient rooms, activity rooms, guest, and waiting rooms. Order today for free shipping! Roosevelt High Back Wood Armchair. The curl detail at the top of the back is complimented with a curl detail on the armrest which also provides support when entering or exiting the chair. The lower frame offers additional support rails for greater strength and stability. Comfortable seat with ultracell foam.